Economic reforms, carried out in Republic, form the concrete directions of actions in order to remove barriers which are prohibitive for investment activity and the realization of the program by investment advance. Kyrgyzstan, trusting in the principles of freedom and democracy, is becoming a country able to the efficient social dialogue and dynamic development. The Kyrgyz Republic - the state in the northeast of Central Asia. It is located within Pamiro-Alayi in the southwest and Tian-Shan - in the northeast. Borders - on Kazakhstan, Tajikistan, Uzbekistan and China. 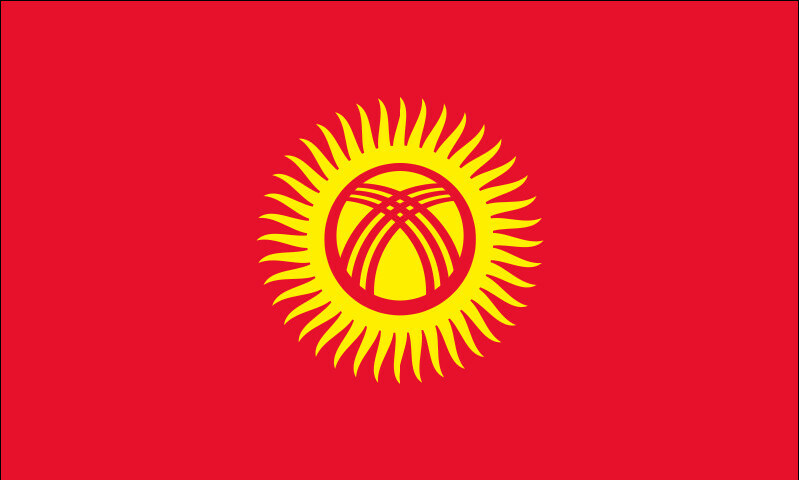 Coat of arms of Kyrgyzstan. 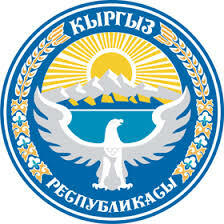 Arms of Kyrgyzstan – official state symbol of Kyrgyz Republic; designed by authors A. Abdraev and S. Dubanaev and accepted on 14 January 1994 by Decree of Parliament. In the centre of arms against a background of Issyk Kul Lake and ridges of Ala Too, where the sun rises, situated image of white falcon with sprawled wings symbolizing freedom and independence of Kyrgyzstan. Silhouette of sun is a symbol of life, wealth and abundance. This element takes a main place in the state symbols. Top of mountains alighted by the sun looks like Kyrgyz national headwear- “kalpak”. According to the ideology of nomads a special place belongs to steppe eagle or golden eagle. In the symbolic language silhouette of golden eagle means state power, wideness and far-sightedness. For steppe nomads it is symbol of freedom, independence, urge towards an aim, to highness, fly into future. On the Kyrgyzstan arms it is gyrfalcon “Ak - Shumkar” of Manas. 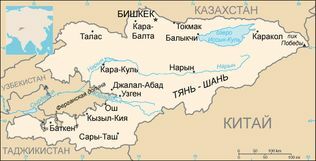 Languages - Kyrgyz - state, Russian - official. Territory: 199,9 thousand sq.km (5,8 % - the woods, 4,4 % - waters, 53,3 % - agricultural grounds, 36,5 % - other lands). Nearly 90 % are located above 1500 m above sea level. Number of resident population for January 1, 2018 - 6,2 million people. The capital - Bishkek (1 million people). Big cities: Osh (288 thousand), Dzhalal Abad (117.2 thousand), Karakol (77.7 thousand). Shares on 7 administrative areas — Chuy, Talas, Issyk-Kul, Naryn, Jalal-Abad, Osh and Batken. The regional centers - Talas, Karakol, Naryn, Dzhalal Abad, Osh, Batken. Climate - sharply continental with cold winter and in the hot summer, strictly depending on height above sea level. A precipitation, generally concentrates in the autumn, in the winter and in the spring while the summer usually happens dry. Religions - the majority of believers – Muslims. There are Christians: orthodox, Catholics and Protestants (Lutherans, baptists, Adventists). The Republic parliament — to Zhogorku Kenesh has a priority of the decision and definition of the most important decisions and policy of the state, is unicameral, and consists of 120 deputies elected for a period of five years on party lists. The President is elected by national vote for a period of 6 years, without the right of re-election to the second term. The same person can't be elected the President twice. The Head of the government — the prime minister, is appointed by parliament on representation of parliamentary fraction of the majority (deputies from the political party which has received more than 50 percent of mandates).